This template bit features a cutting height of 1/2" and a cutting diameter of 3/4". The overall length is 2-3/16" and the shank is 1/4" in diameter. 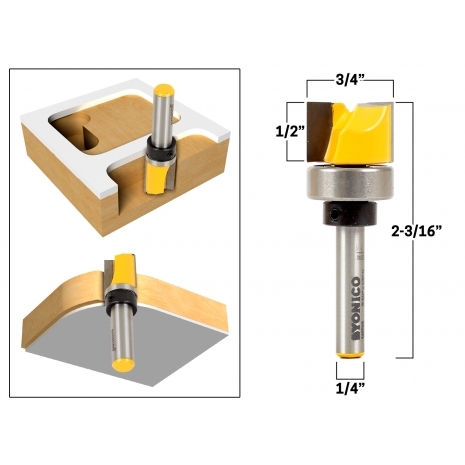 Flush trim template router bits work in your router table or handheld router. Secure your template to the top face of the work for handheld operations, or to the bottom face of the work when using a router table. It's helpful to have at least a couple of flush trim bits in different sizes in your router bit collection. 1/4" and 1/2" diameters make a good combination.